My son and I take turns with the chores. One week he packs our lunches for the day, and the next I do. On the weeks he packs, he always makes sure to tuck a Little Bites into my lunchbox (and of course, his too). ;) I don't mind, they're pretty tasty. We both have our own favorite flavor, and on the weeks I know he'll be packing, I always make sure to have some of each in the house. I also take them with me sometimes as a snack, if we're going somewhere that's going to have us away from home for a good bit. Making sure there are snack options for the kids ensures they don't get grouchy before we get home to eat a proper meal. Besides tasting great, it always seems Entenmann's Little Bites® is also doing something great. Right now they've partnered with Terra Cycle, another wonderful organization, to help the environment in a big way, and to give away great prizes (I also have a giveaway at the end of this post). See these convenient pouches that the Little Bites come in? They are also recyclable!! 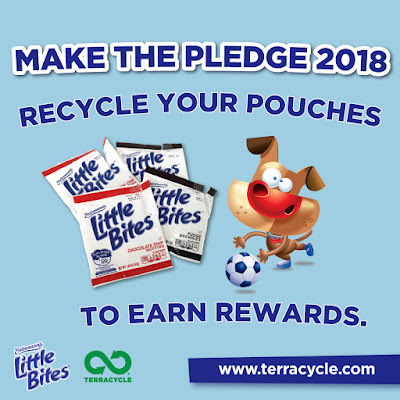 Little Bites® and Terra Cycle have teamed up for the Make a Pledge Program, which is really worth reading into, and definitely worth being a part of too. In addition to the great items that these can be recycled into, such as park benches, recycle bins and playgrounds...they are also interested in giving back in other ways to you too. One of those is a fun giveaway they have going on now through April 30, 2018. Learn more towards the end of this post (where you will also find my giveaway too). 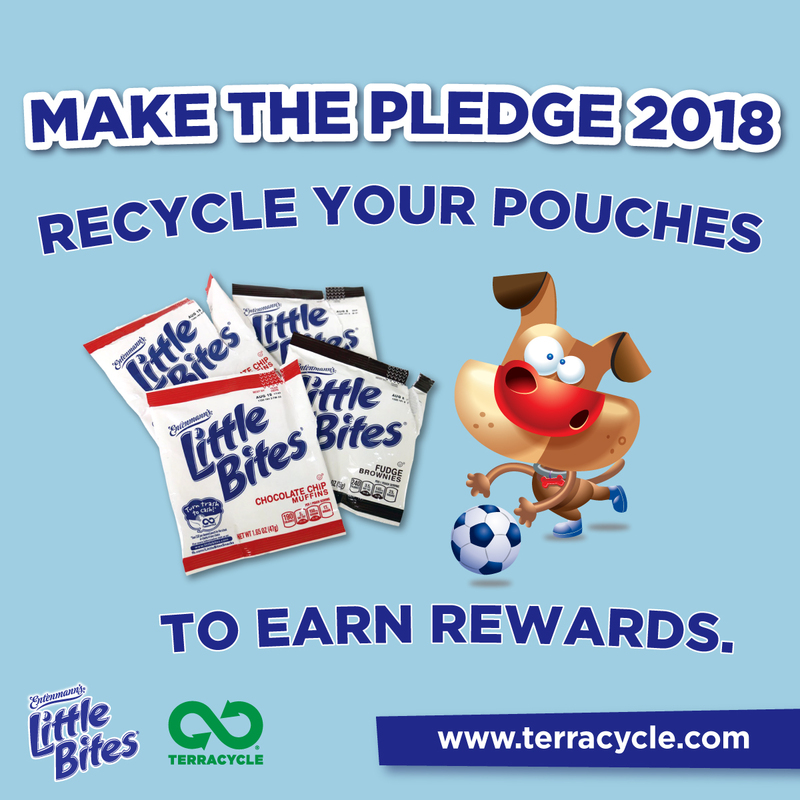 “Make the Pledge” to recycle with TerraCycle® and Entenmann’s Little Bites® and be rewarded for it! How to Win their Giveaway! How to Win My Giveaway! Blueberry are so good and take the byte out of hunger. What a great thing to do. I love the classroom party idea. Your son is growing up and he's so handsome too. I have been a fan of Entenmann's for several decades and buy them whenever I can. Little Bites are super yummy snacks. We love Little Bites! They really are perfect for being on the go. I love a lot of Entenmann's products. I like the Little Bites crumb cakes and the raspberry danish twist. We love Entenmann's products!—thanks for the chance to win some! Little Bites are always in the house; and my granddaughter especially likes the party muffins. Thanks for the giveaway! I like the chocolate chip stuff. My kids love Little Bites as a school snack. My family and I love Little Bites. They make great snacks for when we're on the go. Great snacks, great company. Thank you for helping out our schools. Blueberry Little Bites are my favorite, my grandson loves the chocolate chip ones! Great for snacks too!! We enjoy little bites for after school snacks, while hiking or sharing a picnic - they are a staple in our lives. I enjoy these snacks often, thanks. Oh these would be so wonderful to send in their lunches! These are a favorite snack for our family, especially the fudge brownie bites! I know they aren't the healthiest for us but everything in moderation, right? These make for the perfect after school snacks. It holds them over until dinner time and my kids love their muffins. Love these snacks. They are portable and everyone enjoys them. Thanks for the chance to win. The fudge brownie flavor is really good. I love these for traveling and taking a break with a delicious snack! They are so tasty and keep fresh with separate snack bag size servings. my family would like these as a treat! My son loves Entenmann’s Little Bites®. I just bought him a box yesterday! We always recycle also! Little Bites muffins are the best! My grandsons love eating these in the morning with breakfast. Their favorite is chocolate chip. Love their blueberry muffins which is the only flavor I have tried so far. I love have their mini muffins as an afternoon snack. I have lately been craving blueberries and these sound delicious. But then my husband would love the chocolate chip as he loves loves chocolate. Little Bites is great. We eat them all the time. We buy Little Bites all of the time. Thanks for the contest. I pledge to recycle my Little Bites pouches! I love Entenmann's Little Bites! My kids love packing Little Bites as a treat in their lunch boxes! The chocolate chip flavor is their favorite. We just recently tried Little Bites and our entire family love them. Entenmanns has been a part of my family for years. My kids love the little bites chocolate chip muffins. We always recycle everything in our house. As for Little Bites, yum! My son loves Little Bites! Gonna get the Brownie ones next time. No better snack than Entenmann's Little Bites, especially the fudge brownies - YUM! I had no idea you could recycle the pouches. Glad to know! I like Little Bites. I like to throw a pack into my purse for those busy days when I know I'm gonna need a little something extra to get me thru the day. We buy Little Bites every single week. The kids are glad the season for the snickerdoodle ones is over though because I would end up eating them and then there weren't any for them. Entenmann's is a classic brand. They have great muffins and snacks. This sounds like a great program for classrooms. My kids love Little Bites. Especially the chocolate chip muffins after school. We love their blueberry muffins! This would be awesome to win. Thank you for the chance! Entenmann's Little Bites are a family fave in my household. My family loves Little Bites our favorite flavor is blueberry. My girls love the pumpkin variety. I wish they had them all year long. Thank you! Little Bites are great. I eat the whole box. We love LIttle Bites! They are great for snacks and to take for school lunches. We love all the Entenmann's Products. Our favorite is the Blueberry Muffins. The Entenmann's Little Bites ® Pouch Recycling Program provides incentives for recycling. We enjoy Entenmanns products very much. Entenmann's is a main staple in my house. These muffins are great to toss in your bag and eat on the run. Kids love them! The kids love these in their lunches or school snacks. These snacks are great! I love taking them on the go! These coupons would be great, we love the blueberry ones. My kids would eat the chocolate chip muffins every day if I let them! It would be hard to choose between the blueberry and the banana. Those are two of my favorite flavors. I love Little Bites. My favorite are the Chocolate Chip Muffins. We always recycle at my house! My very favorite product of theirs was their white chocolate macadamia nut cookies! I miss those!! I like Little Bites. They are so easy for lunches. Thanks for the giveaway! I love the recycle program. And the blueberry muffins!! The little bites are a fun treat when we are on the go. I like them every now and then. Your son looks so happy. I bet he loved his snack. I love these muffins, they are so good, I eat them all the time. Entenmann's Snickerdoodle Muffins make my toes curl! Thank you for the giveaway. The bite snacks look yummy. We love Little Bites. I have a box of the Party Cakes in the cabinet! I have been a fan of Entenmanns for such a long time. I buy them whenever I shop for groceries. I love chocolate chip and blueberry! I only buy Entenmanns donuts! The more things that can be recycled, the better. Blueberry bites are yummy, anything entenmanns' is always good! I love Little Bites, especially the party cake ones! I already love the Blueberry flavor Little Bites the most of all the fine selections available, so seeing as recycling the pouches helping out makes it all that much better. I like taking these as snacks wherever we go! These make great snacks for on the go! I love little bites. My family usually gets the blueberry or fudge brownie ones. I didn't know that the pouches are recyclable. That is great to know. They are great in lunches. So far my favorite is still the lemon crumble donuts. If they would just turn those into bites, would be a best seller. This is a great giveaway, love the little blueberry muffins! I love Little bites, especially blueberry and chocolate chip! My favorite is the Snickerdoodle flavor! We love the Little Bites packages. They're so yummy and really convenient! Each one of us likes a different flavor best, so we try to have a nice selection, lol. I love the Little Bite Crumb Cakes they are such a yummy snack/treat. I love these!! It's been a while since I had them. We love Little bites and the donuts! Yum! We would like to win this!! We love thee! They are great in lunch boxes! I like the Brownie Bites, yum! We love Entenmann’s Little Bites, especially the Chocolate Chip. My family loves little bites. We love them all. thanks. I like having the crumb cakes with coffee as an afternoon snack. We love the Little Bites Blueberry Muffins. I always keep one stashed in the back of the cupboard otherwise I don't get any! My daughter loves the blueberry little bites. What a wonderful thing for them to do. We love Little Bites. I like that you make each others lunch. The Brownie Bites are my husbands favorite snack. Great snacks. We like the blueberry muffin. My kids love eating little bites, their favorite is the chocolate chip ones. These make really good after school snacks. We have been eating these muffins for ages. I love the recycling program. I love both the chocolate chip and banana Little Bites and buy them often to have for breakfast at the office. I love them all. Great to have in the car on road trips. We like the fudge brownies! Mya everyone have a wonderful Easter weekend. I keep these on hand for my grandchildren. Love all of them. We all love little bites in this house! I love it when a company has a great programs like this! My family loves the blueberry ones! I love little bites, they make a great night time snack or snack for work. I like the Entenmanns Little Bites. They are affordable, healthy and great snack to enjoy with others. Thanks for the chance to win such an amazing giveaway. I love the chocolate chip and the blue berry little bites. So good!! I love their blueberry muffins -- in fact, I'll eat anything with berries in it! Little Bites are great for snacks anytime. My favorite Entenmann's Little Bites is the blueberry flavor. I love the Entenmann's Little Bites, they are the perfect size for snacking! My kids love the blueberry Entenmann's Little Bites Muffins.